HOUSTON (CN) – In a flood-prone Houston congressional district that Hillary Clinton won by 1 point in 2016, Republican incumbent John Culberson is citing $141 billion in hurricane relief bills he helped pass in 2017 as proof he should keep his job. But the Houston Chronicle has endorsed Democrat Lizzie Pannill Fletcher, saying Culberson’s “career has been spent promoting his own pet projects,” such as encouraging NASA to probe for alien beings on one of the moons of Jupiter. 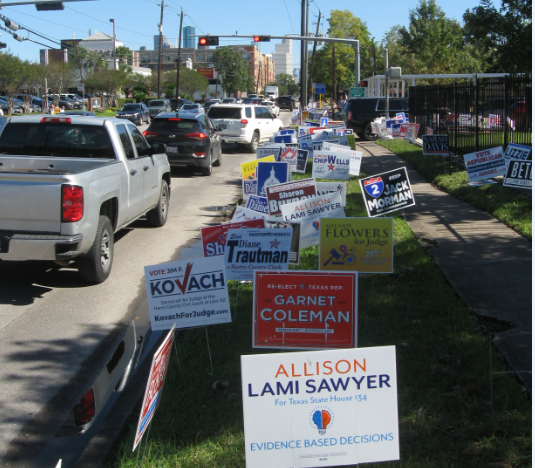 Texas Congressional District 7, a crab-shaped home to 800,000 stretching from south and west of downtown to the northwest and north, features the worst and best of Houston. Its diversity is undeniable; so is its gridlock. With a $73,000 median household income, the 7th is one of the wealthiest districts in Texas. Its population is 44 percent white, 10 percent Asian, 12 percent black and 31 percent Hispanic. 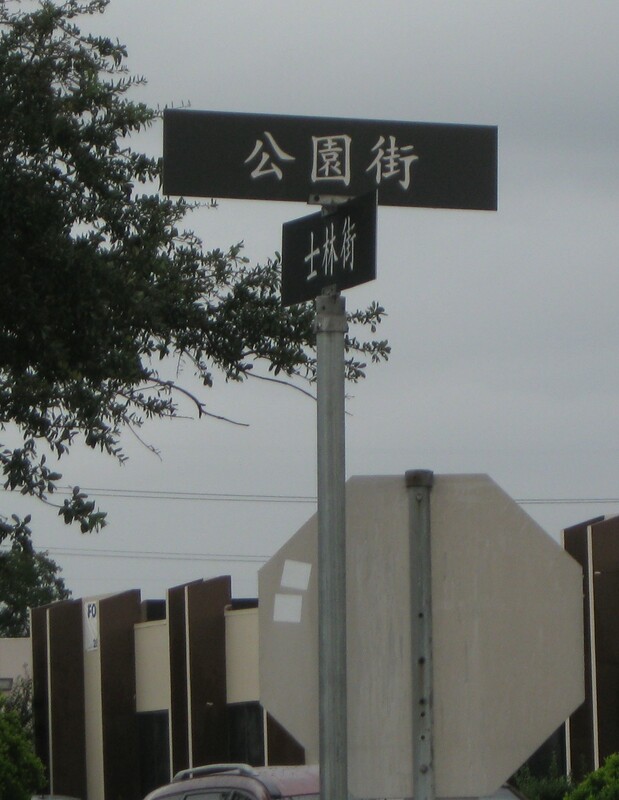 It contains the city’s Chinatown, where some street signs are in Chinese, and the suburb Meyerland, where the faithful flock to a Jewish community center with a Holocaust memorial in the lobby filled with soil from a ghetto in Poland. A hard rain in District 7 can turn a short commute into an hours-long odyssey as bumper-to-bumper drivers navigate fast-forming ponds and a maze of construction sites. Republican John Culberson, 62, has represented District 7 since 2001. 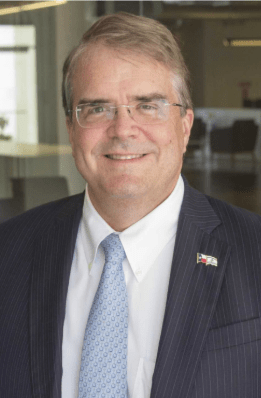 Culberson started in politics in 1987 when, as a law student in Houston, he was elected to the Texas House of Representatives. “Culberson’s been there so long it’s like a comfortable old shoe,” said Carmen, 55, outside a Houston early voting site on Friday. She asked that her last name be withheld. As a member of the House Appropriations Committee, the avuncular Culberson returned to Capitol Hill from Houston shortly after Hurricane Harvey unleashed its epic rains. He helped secure the $141 billion hurricane recovery package, the largest such aid in U.S. history. 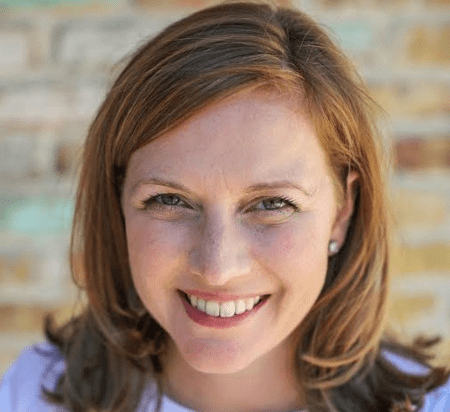 His Democratic rival Lizzie Pannill Fletcher, 43, is the first woman to make partner of the AZA Law Firm. In an Oct. 22 debate with Culberson, she said she has lived in District 7 nearly her whole life and the negotiating skills she’s developed as an attorney will serve her well in Congress. Fletcher says Culberson has not done enough to protect Houstonians from flooding, as far back as his response to Tropical Storm Allison, which flooded 70,000 homes in 2001. District 7 juts south of downtown into the Texas Medical Center, a complex of hospitals world-renowned for cutting-edge cancer treatments. Culberson said that in Allison’s wake he obtained federal funding to install submarine doors in the basements of the medical center’s hospitals, and to move their equipment and utilities upstairs. Thanks to those changes, a hospital lobby that Allison inundated with 38 feet of water had only a wet carpet after Harvey dumped 41 inches of rain in August 2017, Culberson said in the debate. The Houston Chronicle endorsed Fletcher in early October and gave her backers ammunition for an attack ad, faulting Culberson for trying to get NASA to look for aliens on one of Jupiter’s moons. The Independence USA PAC, former New York mayor Michael Bloomberg’s political action committee, is running an ad showing Culberson riding a cartoon space ship. “John Culberson’s ideas are out of this world. He wanted NASA to search for aliens on Europa, an icy moon 390 million miles away. Here on Earth, the Houston Chronicle wrote that Culberson failed to properly fund flood control,” the narrator states. District 7 is one of four Texas U.S. House districts that might be flipped to Democrats, who need to flip 23 seats to reclaim the majority in the House. A New York Times/ Siena College poll completed on Oct. 25 predicted a photo finish, with Culberson at 46 percent and Fletcher at 45 percent. The district is one of a handful nationwide with Republican incumbents and voters who favored Clinton over Donald Trump in the 2016 presidential election, and the high stakes have loosened checkbooks. Fletcher, the Democratic Congressional Campaign Committee and left-leaning super PACs spent $11.9 million on the race; while Culberson, the National Republican Congressional Committee and a GOP super PAC spent $7.3 million, according to the Texas Tribune. Fletcher has criticized Culberson for repeatedly voting to repeal the Affordable Care Act aka Obamacare. She says she wants to shore up the health care law so insurance plans on the federal marketplace are more affordable. In place of Obamacare, Culberson wants to let people shop for cheaper health plans across state lines, buy prescription drugs from foreign markets such as Canada and allow small businesses to band together to negotiate lower rates. He also wants to set up high-risk pools in which people with pre-existing conditions can buy taxpayer-subsidized insurance. On immigration, Culberson supports a guest-worker program, but says undocumented immigrants who commit crimes, no matter how minor, should be deported. Culberson said in the candidates’ lone debate that he is proud to have signed the Republican tax cut, which Trump signed in December 2017, cutting the corporate tax rate from 35 to 21 percent. “When you cut taxes, the economy grows,” Culberson said. But Fletcher is sounding the alarm on the ramifications of the tax cut, which the Congressional Budget Office projected will increase the national debt by $1.9 trillion in the next 10 years. She said in the debate that Senate Majority Leader Mitch McConnell, R-Ky., has stated that to offset the lost taxes, the first thing he will look at after the elections is cutting Medicare and Social Security. Culberson said in the debate that those programs are unsustainable, which is why in each session of Congress he proposes a balanced budget amendment to the Constitution. 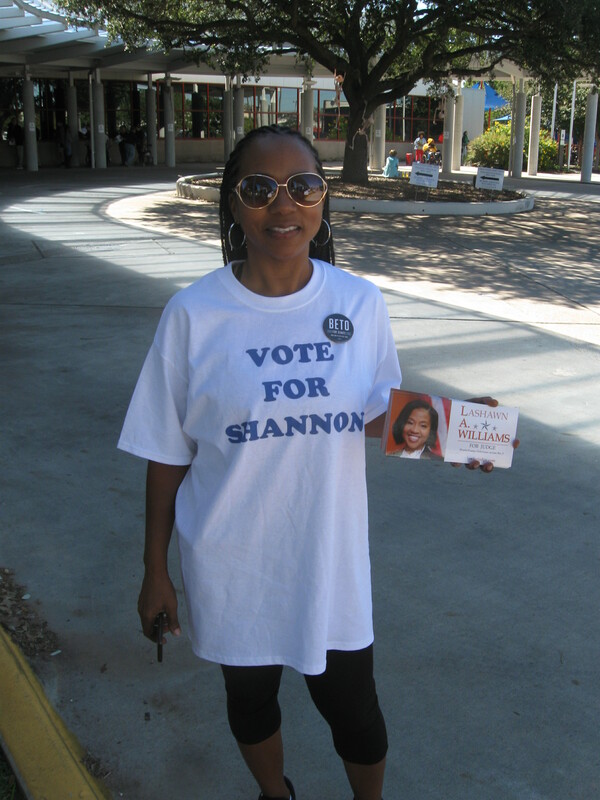 Linda Jefferson, a 48-year-old mental health therapist, supports Fletcher. Asked if his support for the business tax cut undermines his goal of a balanced budget and his description of himself as a fiscal conservative, his campaign manager said the tax overhaul was worth it. “Ninety percent of Americans saw an increase in their take-home pay, millions of Americans earned bonuses, the nation’s unemployment rate has dropped, and consumer and business confidence in the economy continues to grow,” Catherine Kelly said in an email. “The vast majority of our country’s debt is driven by automatic spending programs that have gone unchecked, which is why a balanced budget amendment is so critical to our nation’s future fiscal health,” she added. Linda Jefferson, a 48-year-old mental health therapist, laughed when asked at an early voting site Friday if the tax cuts had helped her. “I’m not high enough in the tax bracket,” she said. Jefferson said she is not impressed with Culberson’s record in Congress and believes Fletcher is more in touch with Houstonians. “She comes across as honest, genuine and sincere. If you’re in a position for a long time and haven’t really done much, I don’t need you to get on your commercial and tell me what you’re going to do,” she said.